Our principal mortgage banking subsidiary, PennyMac Loan Services, LLC (“PLS”), is a non-bank producer and servicer of mortgage loans in the United States. Our principal investment management subsidiary, PNMAC Capital Management, LLC (“PCM”), is an SEC-registered investment adviser. PLS is a seller/servicer for the Federal National Mortgage Association ("Fannie Mae") and the Federal Home Loan Mortgage Corporation ("Freddie Mac"), each of which is a government-sponsored entity ("GSE"). It is also an approved issuer of securities guaranteed by the Government National Mortgage Association ("Ginnie Mae"), a lender of the Federal Housing Administration ("FHA"), a lender/servicer of the Veterans Administration ("VA"), and the U.S. Department of Agriculture ("USDA"). 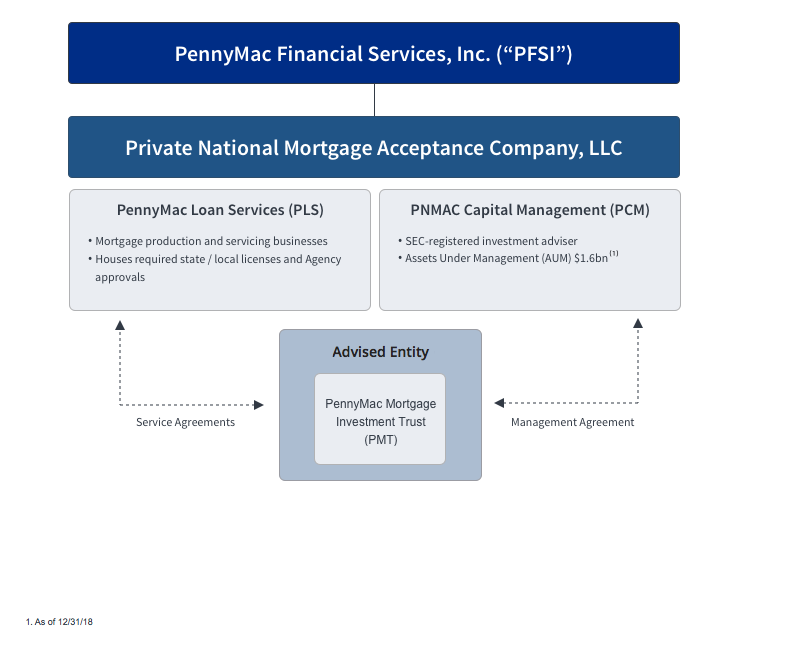 PCM manages PennyMac Mortgage Investment Trust (NYSE: PMT), a mortgage real estate investment trust.